Forklift Fork Extensions Get More Fork Under Heavy Loads! Home » Heavy Duty Forklift Fork Extensions For Sale – Can Be Shipped UPS! Forklift Fork Extensions are intended for the infrequent need to move large bulky loads. An extra set of longer forks is a lot better choice. If fork extensions are to be used, good safety measures should be followed. All safety measures recommended below are not supposed to substitute or take the place of the forklift operator’s manual or the requirement to evaluate and observe local, state and federal safety laws & regulations. ◆ Overall length of fork extension must not exceed 150% of fork length. ◆ Inside width of fork extension must not be more than ½” wider than fork. ◆ Forklift capacity is substantially reduced when center of load is moved out beyond standard 2 ft. load center. ◆ Do not pick up load with tip of fork extensions. ◆ Load must be centered on fork extensions or closer to the backstop. 1) The overall length of the forklift fork extension cannot exceed 1 ½ times the length of the fork – for example, the longest extension that can be used on 48” forks is 72”. 2) The fork extension should be built to fit the particular width of the fork that is being used. The inside width of the extension must not exceed the width of the fork by more than ½”. 3) Never pick up a load with the tip of the fork extension. The center of the load must always be over the fork and should not exceed 50% of the length of the forklift fork extension. For instance, the load center with 48” forks (72” extensions) should not exceed 36”. 4) Be very careful not to overload the forklift. The capacity of the forklift decreases quickly as the load center is moved out from the back of the fork. The forklift manufacturer ought to be able to make available a load chart showing maximum lift capacities at assorted load centers. 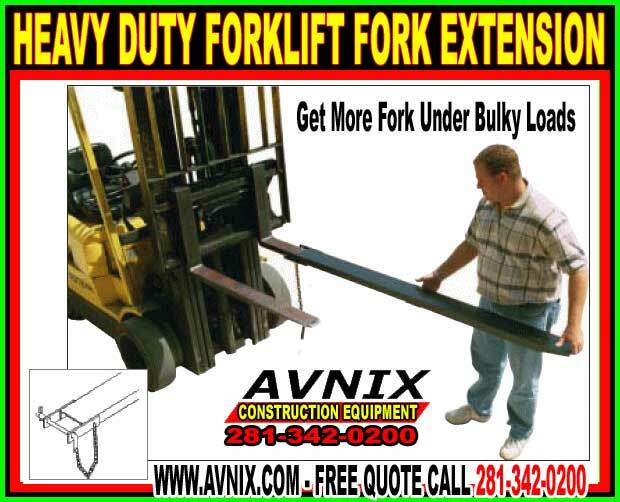 5) Forklift fork extensions are intended for light bulky loads. If you have heavy loads or will be exceeding maximum allowed load center (36” for 72” fork extensions), you ought to think about longer forks in lieu of fork extensions. AV-1664 72″ 4″ x 48″ forks 120 lbs. AV-1665 72″ 5″ X 48″ forks 140 lbs. AV-1666 72″ 6″ x 48″ forks 160 lbs.